Of all the places we’ve visited in China, Dali probably wins out as our favorite. Located in China’s southwest Yunnan Province — about a two hour train ride south from Lijiang — Dali was once known as China’s backpacker paradise but is said to have lost some of its granola appeal in the last decade. That may be so, but Dali still oozes charm. Funky shops, delicious restaurants serving real Western breakfasts with free wifi (and lots of local eateries, too, but hey, sometimes nothing beats a few eggs and whole wheat toast) and super friendly people make Dali a fantastic place to spend a few days. It also has much more of an open, accepting vibe than many other destinations in China, which makes sense as Dali is closer to the border to other southeast Asian countries such as Thailand and Vietnam. 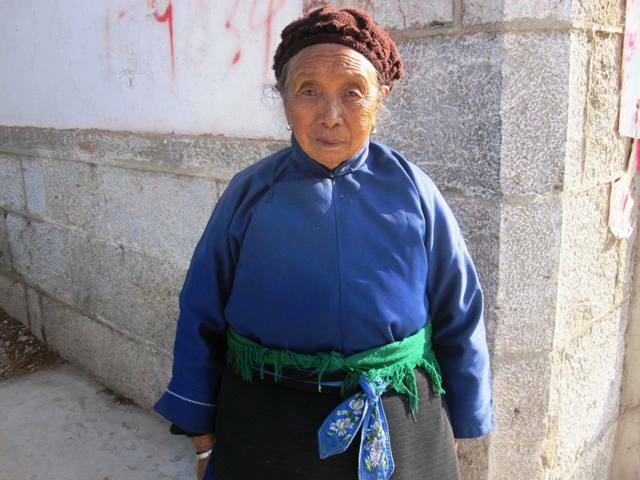 In fact, the ethnic minority in Dali, the Bai, are said to share the same ancestry as the Thais. Not only does the town of Dali have a laid-back, eclectic, artsy feel, but the countryside immediately surrounding Dali can not be beat. If you are in China and yearn for the pristine outdoors, this is where to go. 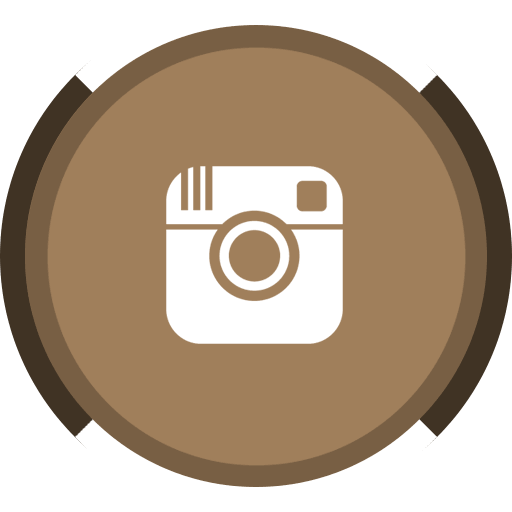 Mountain treks, gondola rides, alpine lakes … it’s all here. Access is easy and prices are reasonable. Sam and I rented decent cruiser bikes to cycle a part of the famous Erhai lake (one of the seven largest lakes in China, covering 250 square kilometers) for about five bucks a person for the whole day. The rest of the bike trip? Free! Where to stay: Dali is packed with great, affordable guest houses, but we stayed at Rainbow’s Nest right in the heart of Old Town Dali. Rainbow, the owner, is super friendly and speaks great English, the rooms are the biggest and cleanest we’ve seen in China and the prices were awesome (we paid around $35 USD a night for a huge private room with heat, wifi and a private bathroom). She also helped us book a driver to shuttle us back to Lijiang (for our departure flight) with a stop in picturesque Shaxi along the way, which ended up being one of the highlights of our trip to Yunnan Province. 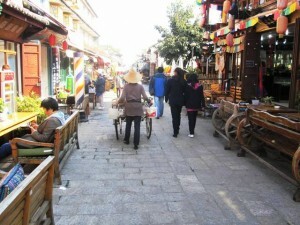 A photo tour of Shaxi will be in a follow up post. 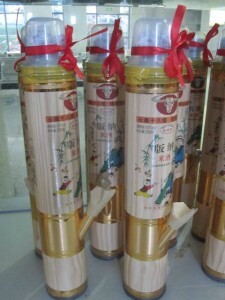 Contacts for Rainbow: 104 Guangwu Rd, Old Town; +86 153 48721 086; dalihappyhouse (at) gmail (dot) com. Oh, and one final note about staying at Rainbow’s? The free use of the washing machine downstairs! 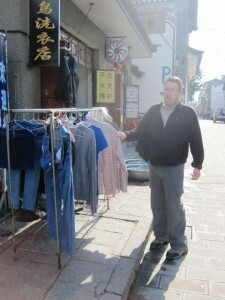 But should you have more clothes than the tiny machine will accommodate, a laundry shop is right down the road. Just be prepared to find your clothes drying outside on the sidewalk! Where to eat: Dali has a surprising range of restaurants and street-side stalls. 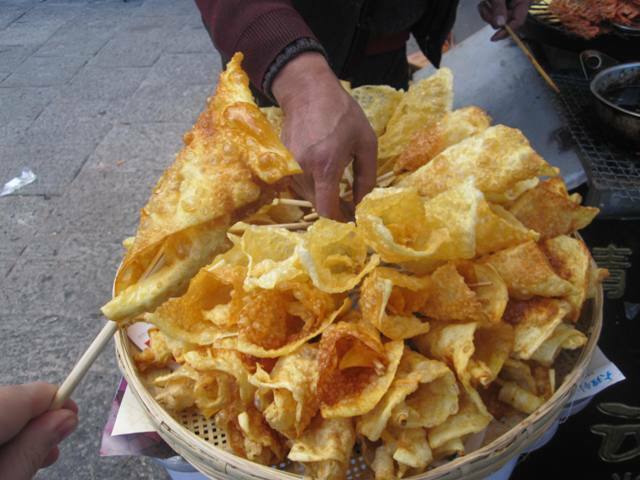 But, if you want to try something you most likely won’t find elsewhere, head to the Yunnan Cafe for a tasty yak steak … or hit the streets for Dali’s ubiquitous fried cheese. Mmm, mmm! Also, Dali has a microbrewery called Bad Monkey that serves up a tasty porter (although it’s a bit on the pricey side). How to get there: Dali has an airport as well as a train depot and bus station. 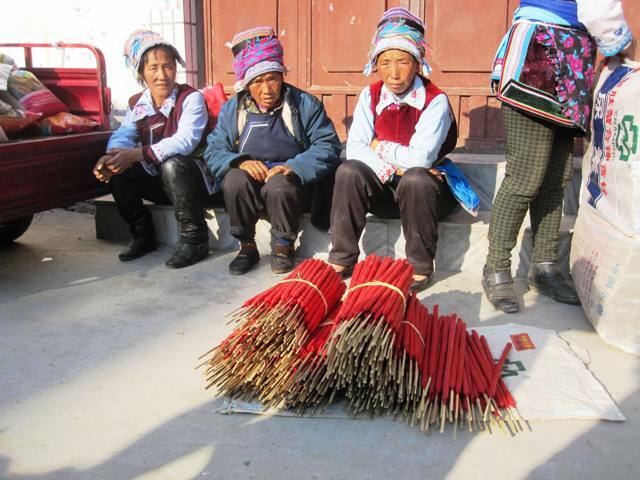 We took the train from Lijiang and I’m glad we did. The train ride is only about 2 hours and offers pretty scenery … when you can actually see it as there are tons of tunnels along the way. A note on “hard sleeper” tickets: The thing we weren’t prepared for was the train “seats.” We paid for the cheapest fare (only about $5 USD per person) but we didn’t know we’d be sharing a seat … on a bed! Seriously. Quite to our surprise, we found ourselves perched side by side on a lower bunk bed in a small cabin with two other people on the same bunk. 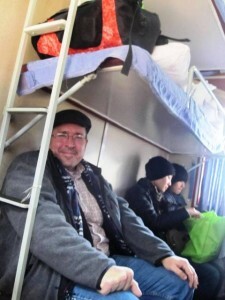 Directly across from us, about two feet away, the other lower bunk had four more people facing us. The ride wasn’t that long, so it wasn’t that big of a deal, but I thought it worth noting. But perhaps the creme de la creme of our train ride experience was the waiting room itself. Right before our train departed from Lijiang to Dali, I dashed into the convenience shop to buy some water and a snack. I had no idea what awaited. Now, I am no expert, but does this look like a ganja bong to you?!! There were tons of these — and about three different brands! It probably isn’t too obvious from the picture, but these things have the “ingredients” pre-packaged inside the plastic top. Those Lijiang folks really know how to run a gift shop. There’s nothing that says “Wish you were here” like a souvenir of bong, no? Getting into Old Town: One thing to keep in mind when arriving in Dali is that the train station and the airport are both in Dali “New Town” which is actually about a 30 minute drive to Dali Old Town (the latter being where you’ll want to stay). Taxis from the train station to Dali Old Town will run about 50 RMB (a little over 9 USD). What to do: That’s the problem, actually, because there’s so much to choose from. Sure, there are attractions within the town itself like the famous three pagoda’s, but for us, the real draw was the amazing scenery. 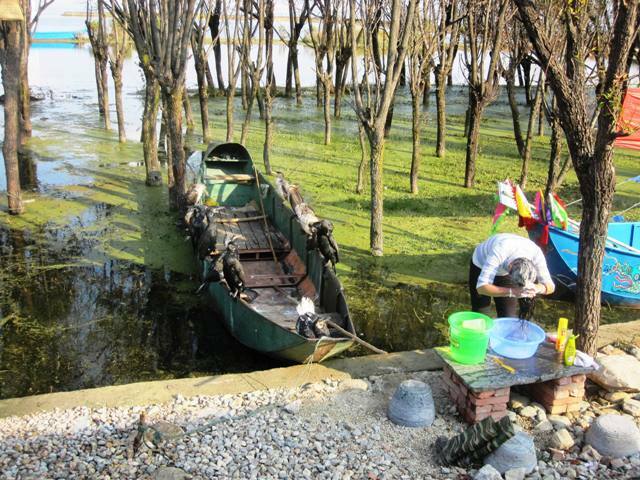 Lakes, rice fields, mountains, quaint villages … it is all so amazingly beautiful. Our bike ride along Erhai Lake was definitely the highlight; our only regret was that we only covered about fifteen miles out before nightfall required us to turn back (we had a late start and I stopped for way too many pictures). If our butts weren’t so sore the next day, we would have tried for another ride, but alas, it was not meant to be. At any rate, this bike path is the best I’ve seen in China as the road is clean, wide and well marked. Few motor vehicles use it and the road winds all around the lake, snaking through fields and marsh and tiny villages where fresh markets are held in the square and old ladies just might invite you home for a cup of cha. So awesome. And as for the weather? Perfect. Even in winter with snow on the ground, the sun was out, the air crisp, the fields green and during the afternoon, it stayed around a comfy fifty degrees Fahrenheit. If you are in the area and have a day to do this, go! 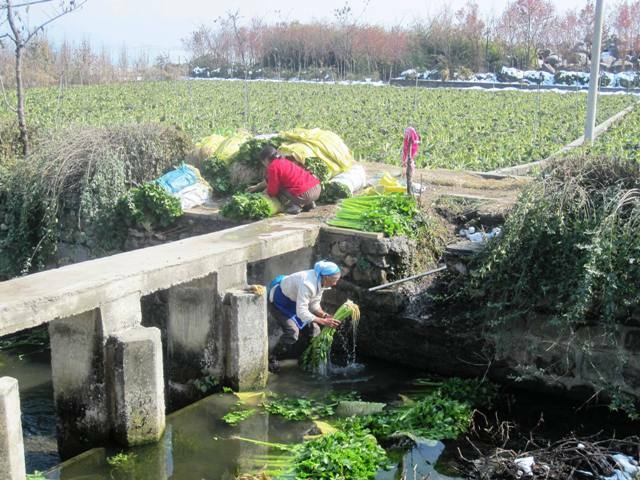 Women washing vegetables. 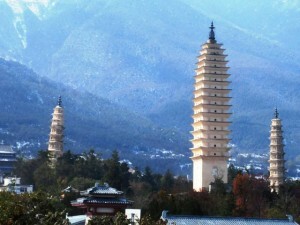 The road from Dali to Erhai lake is about 2 kilometers. Along the way, you’ll pass views like this! 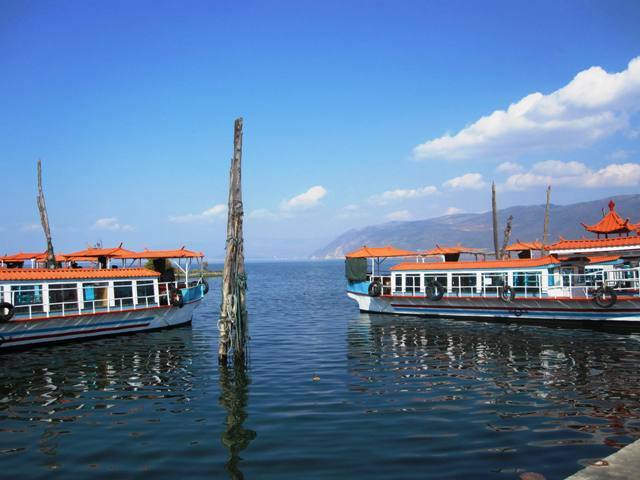 Ferries on Erhai Lake … these are government run and much more expensive. If you continue north along the bike path, you’ll find loads of “contraband” boats where fisherman are delighted to oblige you on a lake tour. Cormorant fishing boat off Erhai. 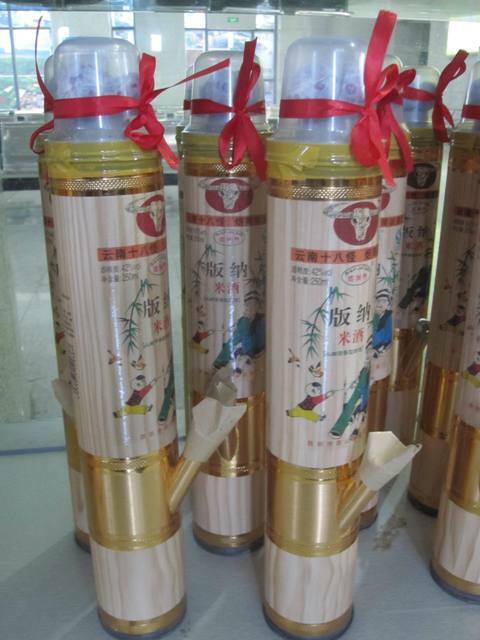 These fisherman use the birds to catch the fish in the water! You can take a tour with them for a nominal price — several groups of these boats can be found along the lake. 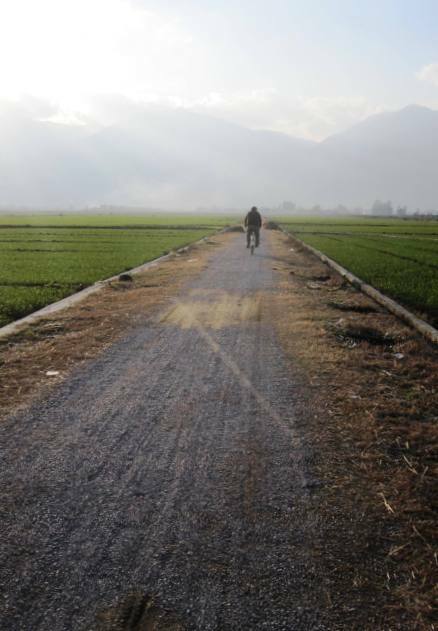 Riding through fields (leaving Erhai Lake to return to Dali). Great post, Jesse and Sam! 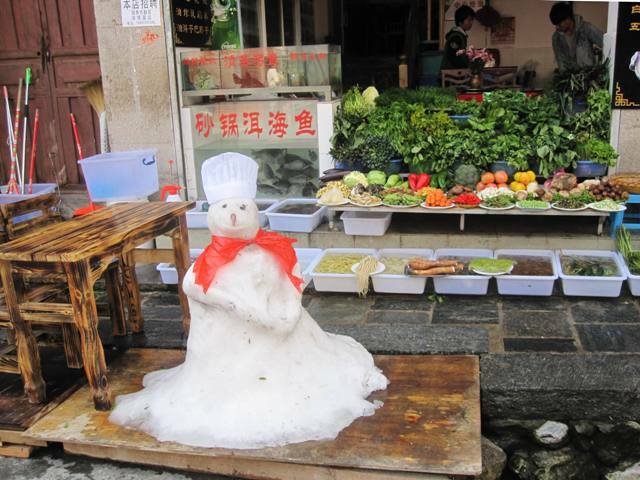 I love the locals’ photos, especially the vegetable washer. Wishing you both happy trails…I’m back in Tonga now 2 months and just received my copy of Liberty Frye forwarded from the US…she’s just been imprisoned and the shark plane has dumped Ginny…review on the way soon…no worries, my broken wrist won’t keep me down! God bless, N.
Yes, Dali was probably the prettiest place we’ve seen in China so far. The air is clean, the sky blue and the scenery, truly beautiful. Our only regret is that we didn’t stay there longer. 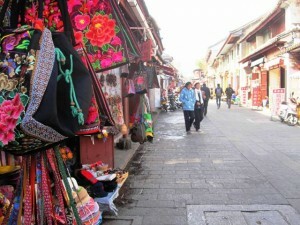 It was a world away from the bustle and apartment-complex-world of Tianjin! 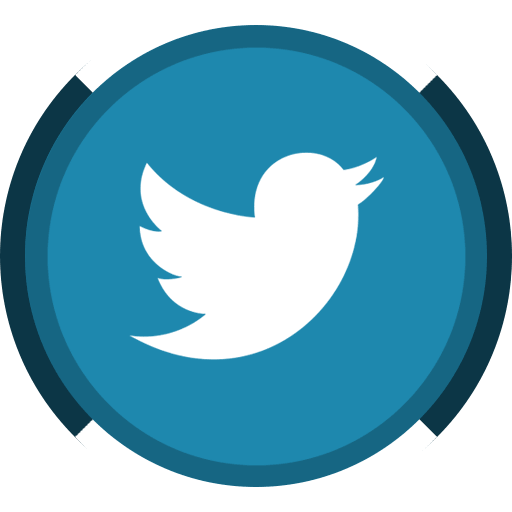 Let us know what you’re up to when you get a chance. And thanks so much for reading Liberty Frye! Hope you enjoy it! I’m jealous! 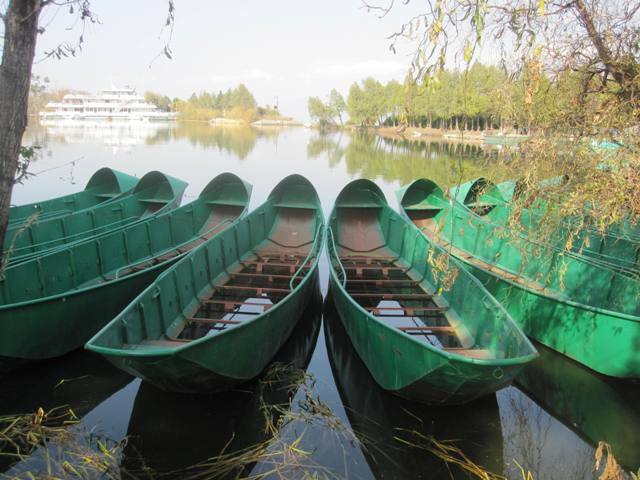 Dali is so much fun and I hope you have a chance to do the Erhai Lake bike tour. 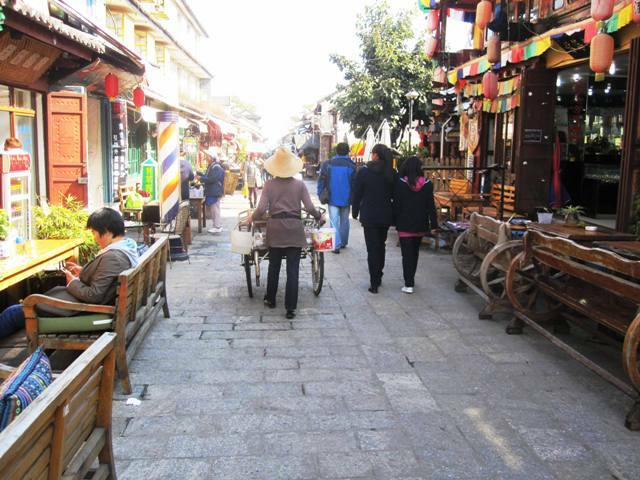 If we could do it over again, we’d stay a night in Shaxi, too. It is so quaint and there is a cliff-side temple about 2 kilometers from town that is supposed to be a great hike … but we just didn’t have the time. At any rate, have fun and thanks for visiting Tonga Time!